Our passion for musical instruments from every part of the world has been our inspiration in tracking accessories and other supplies for the discriminating musician and for master luthier worldwide. Our objective is to offer our clients quality items, accessories, tools, strings etc., at low prices by cutting out the middleman and passing the savings on to you. We offer a limited warranty on everything that leaves our warehouse and workshop, therefore offering you peace of mind and firm assurance as to the quality of our products. In addition, we offer custom services on string manufacturing giving our corporate clients an opportunity to produce their own strings for all kids of instruments, from guitars, violins, banjos, mandolins, bouzouki and other types of international instruments, at low costs and based on your specification. Kyriacos Kakoullis also known as Ken Kalis was born in Cyprus. He began playing bouzouki at the age of 17 and his passion for the instrument has lead him to become not only an accomplished bouzoukist, but also an internationally known bouzouki maker. 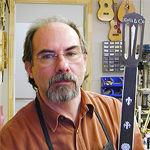 Ken is the producer of the only instructional video course in the world known as “The Practical Bouzouki Method” and he has close to 1,000 students world wide studying his method. Ken has participated in major concerts, T.V. shows and studio recordings. Ken is the original founder of Galaxy Orchestra. Costa has been repairing and restoring Bouzoukia since 2000 when he met Kyriaco. Since then he has also been constructing his own Bouzoukia as well as experimenting with new designs. 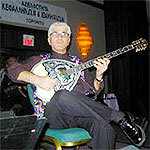 He has been enamoured with the Bouzouki for many years and has been a student of the instrument. Costa was born in Sparti, Greece and came to Canada at a very young age. He originally started with repairing guitars but then he met Kyriaco, and has been working with him and Bouzoukia ever since. Copyright © Bouzouki. All rights reserved.